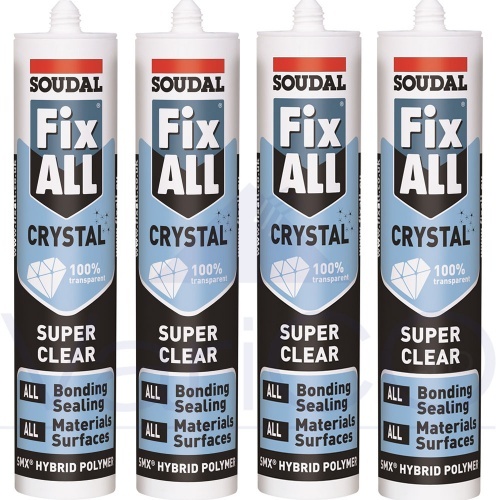 Soudal Fix All Crystal Clear is a clear adhesive / sealant based on SMX polymer technology and is ideal for all sealing and bonding applications on most materials. 100% transparent crystal clear and permanently flexible, it can be applied on wet surfaces and even under water. It is friendly to the environment and the user as it contains no solvents, halogens, isocyanates or acids. It is weatherproof and waterproof and is non staining. Fix All Crystal Clear can be used for all bonding and sealing applications on both porous and non porous surfaces and even on humid surfaces. 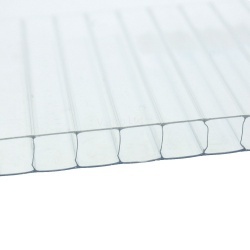 It's crystal clear transparent appearance makes it particularly useful when bonding glass to glass. 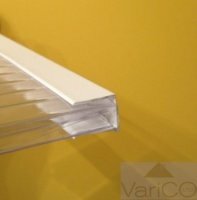 Fix All Crystal Clear can be applied on all common surfaces such as including; Bricks, Concrete, Steel, Metal, Aluminium, Lead, Zinc, Common Plastics, Polystyrene, Polyurethane, Timber, Laminate, MDF, Chipboard, Plaster, Cork, Marble, Natural Stone, Granite, Rockwool, Ceramics, Porcelain, Glass, Glazed Surfaces, Mirrors and is suitable for use in sanitary applications. It is not suitable for PE, PP & Teflon. Substrates should be clean and free of dust and grease. For bonding applications apply in beads or dots on one surface; press together and leave to cure. For sealing applications; apply in the joint in a regular bead, respecting correct joint dimensions. Tool with soapy solution before skin forms. Replace cap after use. 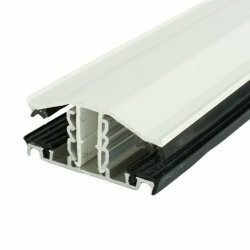 Ideal for use in carports, canopies, sheds and lean to conservatories.